Happy Memorial Day! It’s time to plant the garden. Gardening is an ultimate pretend-to-be-poor pastime: it’s fun, gets you into the sunshine and fresh air, and produces something useful and healthy that you would’ve otherwise had to buy. Unlike hobbies that require lots of expensive equipment or fees and may take time away from the family and friends, gardening is inexpensive, easier than you might think, and a great way to bond with your kids. They love playing in dirt, watering plants, and eating straight from the garden. Growing our own food has made us a richer, healthier, and happier family, and in this post we’ll share some of our tips and tricks for inexpensive organic gardening. Gardening isn’t all about the return on investment, though. If you run a cost-benefit analysis of gardening, don’t compare your harvest to the industrialized farming products you buy at the grocery store, where the tomatoes taste like red nothing. Compare it to the cost of organic, local, responsibly-raised vegetables that taste amazing. Because everything tastes better from the garden! Yes, gardening is fun, frugal, and relatively easy. But gardening also teaches you a skill, and knowing how to grow your own food is quite valuable. Working the soil also connects you with nature, the past, and how people have always obtained food. When you grow heirloom tomatoes, for example, you’re linking yourself with hundreds of years of history. How nostalgic to think I can enjoy the same type of tomato my grandmother ate. Neil would add that gardening is a very manly activity. Producing something by the labor of your own muscles, while securing food for your family the good old-fashioned way, is the essence of masculinity in his book. He also enjoys trouble-shooting the many mini-engineering problems that arise from the endeavor. I’d found gardening has made me a better grocery shopper. Not only do I save money on produce in the summer, I have a richer appreciation for buying fruits and vegetables in-season, locally when possible, and understanding why organic foods and certain vegetables cost more. Knowing all it takes to get from seed to store helps me make better, healthier choices as a consumer. Save on soil by making your own instead of buying expensive bags of dirt. Look for someone who is having a pool put in & get their dirt. For fertilizer, go to a horse farm and get their poo. Seriously, just call around, they are glad to get rid of it. Don’t have a truck? No problem. If you’re driving that old frugal-mobile, you’ll have no qualms about putting down a tarp & loading up the back of it with dirt & manure. We’ve hauled lots of both, multiple times, all without a truck. It’s one more reason not to drive a new vehicle. No yard? No worries. We began gardening in pots on our apartment balcony and expanded to a plot rented at the community garden for $8/summer, which included access to water. When we bought a house we found the soil was too full of clay so we built raised beds. We’d recommend these as they solve lots of problems, including soil composition, drainage, tilling, etc. The most economical shape to build is an 8′ x 4′ rectangle. Purchase 3, 8′ boards and cut one in half. It’s the perfect shape to plant 3 rows of vegetables in each bed. Here’s a picture of one of ours full of lettuce, onions and a few tomatoes. We also compost in a bin built out of old (free) pallets. Put your plant-matter waste, egg shells, coffee grounds, tea bags, grass clippings and old leaves in there, stir periodically, and let the magic happen. Make two, and alternate each year. Go to a small garden center and buy plants by the flat instead of individual pots at the big box store. If you know what you’re doing, starting from seed is even more economical. 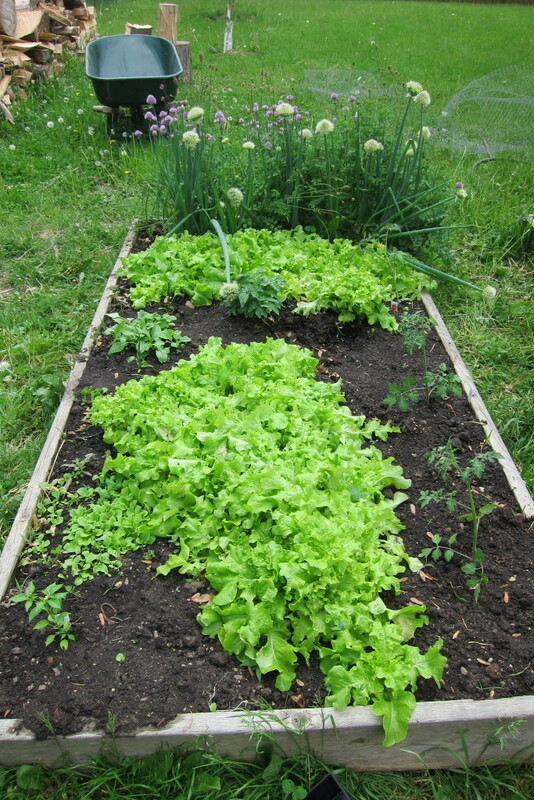 Some plants, like cucumbers, sugar snaps, and lettuce, are easy to grow from seed directly sowed into the ground. What should you grow? Naturally growing what you like and buy anyway is a good value. Our garden hobby was born from our penchant for fresh salsa. But some plants require more time or care than others. We’ve found the best-value vegetables to be lettuce, sugar snaps (peas), tomatoes, cucumbers, hot peppers, green beans, and herbs. These are fairly easy to grow. Zucchini is notoriously easy as well. Other foods, like asparagus, are a little more difficult or take longer to grow, but are expensive to buy, making them a good value. We also grow raspberries, strawberries, horseradish, and fruit trees (apple, pear, plum, and peach). Sugar snaps are a great value. In our opinion the worst value is carrots. They take up space all summer, don’t produce much, and are inexpensive to buy (though, like everything, they taste better from the garden). Bad values also include anything you don’t like or don’t have success growing (for us the latter includes watermelon & corn). This is not a huge expense, but we use a rain barrel & save about $20 per month in the summer on water & sewer bills. A soaker hose is a good investment, too. It’s full of little holes and lays on the grown right next to the plants so more water gets right to the soil, rather than evaporating off the leaves. Keep it simple. We get by with an inexpensive trowel (which doubles as a sandbox shovel), a shovel, a pitchfork for compost, and a couple hoses (some free from the garbage). Neil also received a wheelbarrow as a birthday present from me. He makes tomato stakes out of free wood & gardening twine, and finds similar DIY hacks instead of buying the garden equivalent of bike shorts. Why do you like gardening? Or what prevents you from gardening? Feel free to shoot Neil a gardening question here. He’ll do his best to answer. 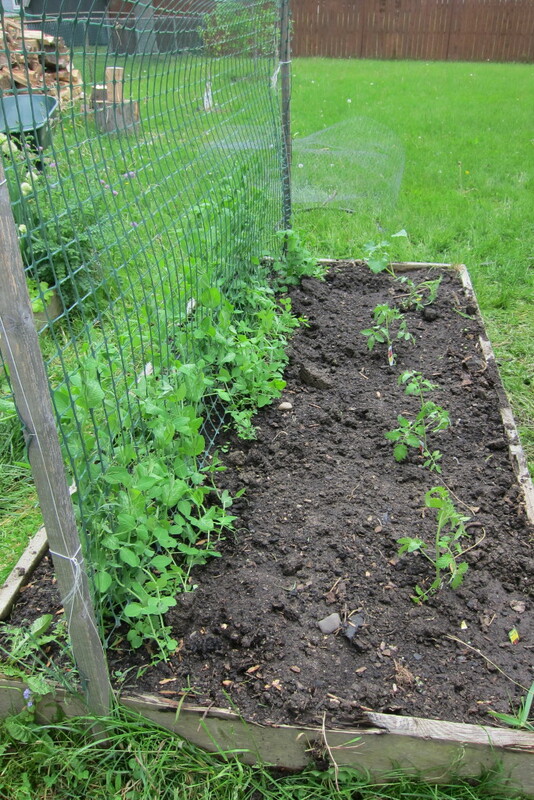 We will have to do raised beds as well (we won’t start our formal garden until next summer, just a few potted herbs and tomatoes this year (and zucchini if it grows)). 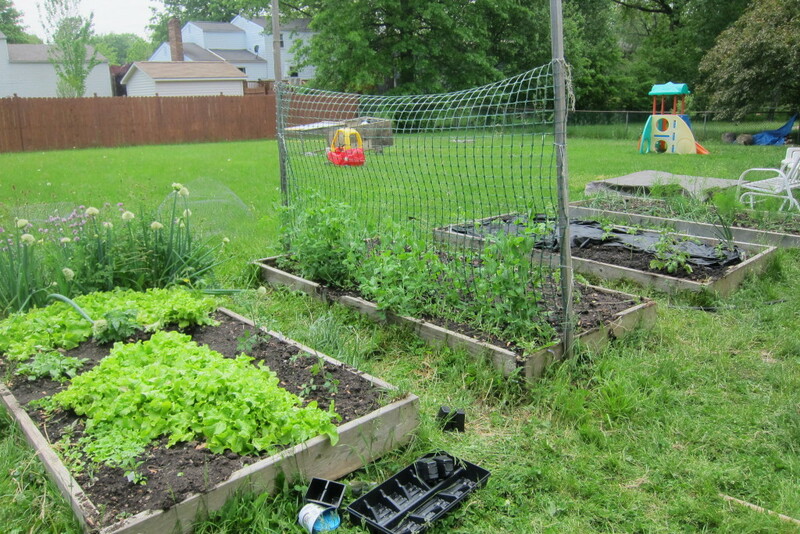 I see that your raised bed doesn’t appear to be a true “raised bed” as in one that has a bottom. Is that correct, or am I mis-seeing that. If so, how’s that working out for you? Neil says: we put newspaper down (to cut down on weeds) before adding the garden soil. We’ve had a successful garden ever since building these 5 years ago. We hope your garden grows well, too! One of the things I was most excited about when we bought this home was that I was going to be able to plant edibles again! Last year we focused on things that would come back so we did some raspberries (we are going to add more next year as most didn’t “take”), a good sized strawberry patch, and 2 apple trees. Next spring it will be a veggie garden and seeing if we can round up some asparagus and rhubarb. I also wanted to say thanks for all of your posts. I am reading newest to oldest and enjoying your writing very much. Thanks, Anne, I’m glad you found us and I look forward to checking out your site. Get started on the asparagus because it takes 3 years! One of the best things about our garden & fruit trees is not having to go the store when you run out of something.